After such a cold and snowy winter, one could only delight in the sight of daisy blossoms. They are right on time. 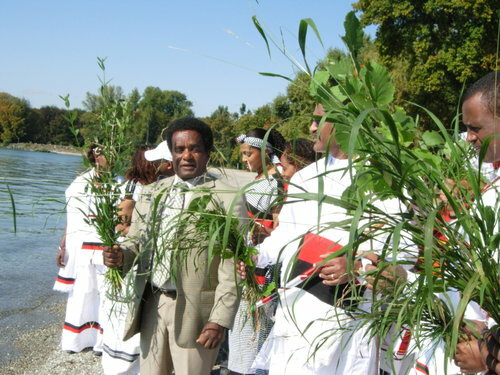 The Oromian Irreechaa Festival is running this year from September 05-October 3, 2010. This festival is a spectacular show of cultural, historical and natural beautification in their full glory at the height of the season. It has spawned somewhat of a science of knowing just when the blooms will peak at blooms and decline, depending on the wind, rain, and sunshine they get. Now it is the beginning of 2010 Irreechaa celebrations, the premier holiday of the Oromo people marks the end of the dark-rainy season and the beginning of a blossom harvest season of Birraa. 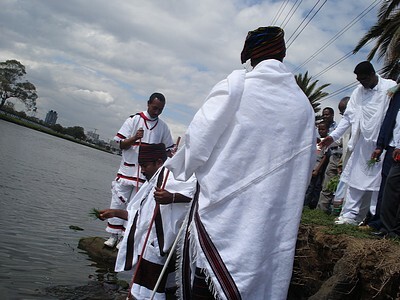 It is in Oromo tradition to gather at the river banks, mountains tops and lakes shores to give thanks to the almighty Waaqaa for all the blessings throughout past years and ask for Araaraa (Reconciliation), Nagaa (Peace), Walooma (Harmony) and Finnaa (Holistic Development) for the past, the present and the future. The Oromos express their resentment, sadness, and happiness, directly to their Creator, Waaqa. No other superior or inferior power is responsible for Oromos’ happiness or sadness apart from their Creator, Waaqa. They blame the misfortune and bad-omen they have encountered in their daily activities, which could be resulted as of negligence or forgetfulness in derailing them away from the main chapters of Waaqa’s Orders. Then, they directly ‘complain’ to their Waaqa for resilience. They believe that, they might have committed cubbuu (sin) at one time that could anger the Tolerant Waaqa. Then, they honestly pray to Him for forgiveness and deliverance by getting together either at the environs of sacred water (hora), on high mountain (tulluu) or being under the sacred sycamore tree (odaa), or at the sacred galama of the qaalluuor qaallittii. Whether the Oromos confront problems or pursue happiness, it is only Waaqa Who is to be praised, and to whom displeasures and/or resentments are directly expressed at the right time and at the right place. One of the right times is the Oromo season of Birraa; and one of the right places is at the bank of Oromo sacred water (Hora). The Oromo Irreechaa Holiday will offer five weeks of festivities for local and international participants alike. From opening week on September 5, 2010 until closing ceremonies on Sunday, October 3, 2010, weekend days will be filled with different shows and activities including, offspring blessing, Girls blessing, Youth dance and music, Media orientation, Public Awareness Making Meeting, and Irreechaa celebration. The Master of Ceremonies is Irreechaa, the perennial mascot of the Irreechaa Holiday at Hora Harsadii, Bishooftuu, Oromia. This popular enlightening event has been honored extensively by different local and international media and summarized as the “Great Cultural, Historical and Natural Harmony Show to See Before You Die”, and recognized as the Best Springtime Festival in Oromia. One of the highlights of the event is the Awareness Creation Meeting – from the beginning of September to the day of Irreechaa through various methods like meeting, singing, and firewood ceremony. The day of Irreechaa begins as the colorfully dressed attendees start to assemble holding Irreessaa-(fresh and green grass) and Keelloo (daisy) blossom. Once a sizable number of people are gathered at a common location, a cheerful group of young people take the lead by enthusiastically singing traditional songs and hymns in turns. After a spectacular and heart-warming cultural display by the energetic youth , organizers announce that it is time to head to Malkaa (the ford) or Horaa (spring water), Tulluu (mountain) where the Irreechaa will be held. Then the elders and spiritual leaders take over to wrap up the sacred aspects of Irreechaa celebration with praise, prayers, and blessings.Visitors enjoy walking together under a sycamore-Odaa tree and pray for greater reconciliation, peace, finnaa- holistic development and harmony. The Oromo lrreechaa Holiday provides a multitude of amazing creations to explore, as talented artists create in their favorite medium – cultural dress! Don’t forget your camera to capture this indigenous Oromo-African Thanksgiving Day forever. 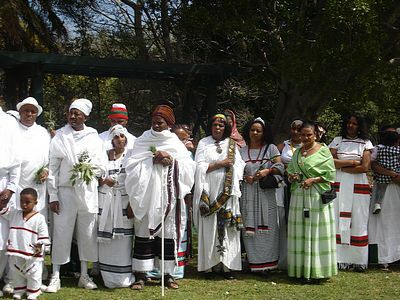 2 pm Irreechaa Ceremony – wear Oromo cultural dress to be a role model in the scene! May Waaqa the upcoming Gadaa Oromoo Irrechaa ceremony make a peaceful and harmonious celebration. 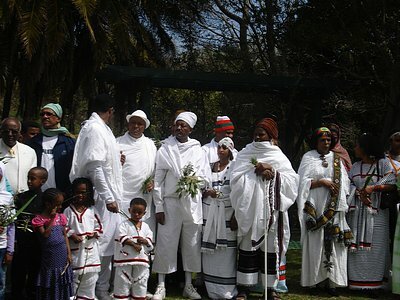 May Waaqa the process of the whole ceremony, the Holy Water of Irreecha, all celebrants, regardless of their religious or ethnic affiliations deliver them from evildoers and seductive invokers. May Waaqa protect them and keep them away from those deliberately or negligibly driving Oromo minors and elders to the camp of ‘Satan’ and satanic invokers. May Waaqa help Oromo peasants harvest and utilise their blossoming crops in peace, make them the beneficiaries of their own sweat of labour, help them prevail over the exploitative enemy. May Waaqa bless the final marriage of betrothed sons and daughters, and help them establish a happy family life. May Waaqa help jaarsa Oromos in their efforts to reconcile previous injuries, pains, conflicts or disagreements to empower justice for the benefit of Nagaa Oromo society. May herds of cattle, horses, donkeys, mules, goats and sheep be at peace with their verdure of grasses and vegetations. May milking cows be at peace with milking vessels and mothers be always at peace with them. May ploughing oxen be at peace with ploughshare and the ploughman with them in peace. After many years’ unseen events, the first national Irreechaa Festival was held in 1991 and later became an annual event, which now runs for five weeks, and is one of the most pleasant reminders in Oromia that spring has definitely sprung! What a wonderful time we had on a cooler than typical spring day in 2010 enjoying all that the Irreechaa Festival presented. This digging was done just because we wanted to know more about the Oromian Irreechaa Festival, and now you know too. Once again CORA would like to thank all great forefathers for their endurance and determination to survive their culture and history paved the way for further social victory. As Oromo new generation, we can still over come our multi-faces obstacles as fast as we holding our glory history and culture-Oromummaa as a master identity under Odaa tree to ensure the survival of their culture and history. A day when Odaa as a symbol of Oromcracy, a symbol suppressed for a century, coming into view is not far. As our freedom fighters say, for the peace and harmony to truly turn to Oromian, our stolen natural rights must be respected. Living with a Glory of Oromummaa! !